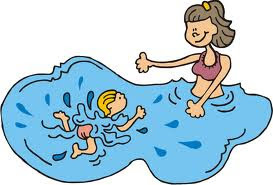 Sweetpea started swim lessons last week. I guest posted for Heather from Sweet to the Soul last week! Click HERE to read the post where I tell exactly what happened! I had the pleasure of meeting Heather IN PERSON last week while she was here on a little vacation! She, Misty, and I got to hang out! I had never met Heather before but it was like meeting an old friend. D Meet ups are the BEST! Sweetpea spent the afternoon playing with Misty's girls. They have so much fun! That afternoon they were playing in the inflatable pool in the backyard. Sweetpea was doing cannon balls into the pool. The inflatable pool. On the the hard ground. She landed on her pod. And.... off it came! Note to self: Next time child is going to be doing cannon balls onto the hard ground, TAPE DOWN THE POD! For the record, this is the first pod that has come off. Even with days full of swimming and baths and gymnastics and tennis. The others have held tight with no tape, no skin-tac, no nothing. That makes me happy. Anyway, Heather got to see Sweets do her second pod change - AWAKE. Normally she would have been a basket case. She would have cried and fought and tried to hide. It would have been ugly. But this time... I was amazed. She put it on and SHE pushed the button. In it went. A couple of tears (the fake kind) and a second later she was done and saying how easy it was and how we could do pod changes any time of day if we wanted to. HUH?!? I'm not sure WHY the pod scares her less... but it does. And I that makes me happy, too! I'm SO GLAD I got to visit with Heather! Now it's your turn. Go on over... And tell her I said HI! Sounds like a wonderful meet-up Hallie. AND thanks for continuing to update us on the pod. I am encouraged that it doesn't fall off easily. Ooo, cannon balls into a little pool...yikes! I am loving that she's not scared of site changes during the day!! Seriously. Awesome! So glad she's loving her Pod. Yay for SWeetPea!! : ) I love fake tears, my Ethan has the BEST crocodile tears, and the loudest cry. It's so cute though. : ) Sometimes only mommas can take it! haha! I'm happy for you guys-it sounds like it's going great with the pod! Cannon balls on her tushie???? Yikes! I will make a note to tell Ellie not to do that . . . pod on her bum or not! what a rockstar she is! It was a really fun meet up and the girls had a blast too!